Scripting meets File Search. The new LoadSearch command is the nexus of two of XYplorer's strongest features: Scripting and File Search. In combination with the Catalog, UDCs, and XYS files, you can now easily build handy libraries of complex live searches. Scripting meets the Web. The new Download command enables you to download any internet content straight into your file manager with a single click or keyboard shortcut! 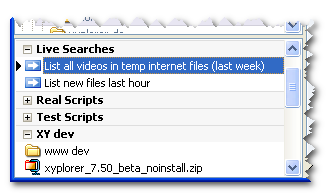 Whatever URL is on your clipboard it will be downloaded to your current folder in XYplorer. You need to regularly download a specific file from the web? Why not do it with a single click! 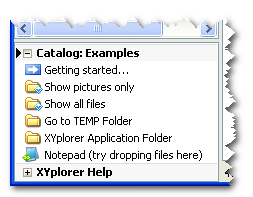 This simple line will download the current XYplorer full package to your current folder. A related command is the new ReadURL, which will read internet content into a variable ready for further processing. Variables have to conform to a stricter syntax: They are represented by a dollar sign ($) followed by the name of the variable. Names start with a letter (a-z and A-Z) or underscore, followed by any number of letters, numbers, or underscores. Dots (.) now function as string concatenators. Hence now, strings containing dots have to be quoted to preserve the dots! The command addstr has been dropped. The release package now includes a sample Catalog which will be used on application startup if no catalog.dat file already exists. Copy Image. 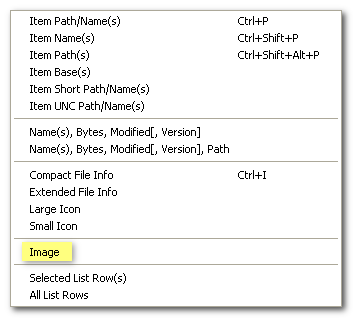 A new command allows you to copy the image of an image file directly to the clipboard without first having to open the file in an image viewer application.